License Expired – How to update Swype? From your device’s home screen, press the MENU button. Choose the language package you want to download. If you have ROOT ACCESS on your device, you can use the following steps to upgrade Swype and maintain your custom dictionary. *WARNING* You MUST follow these directions EXACTLY as described below! Doing these steps out of order will result in PERMISSION PROBLEMS, leading to your UDB being unwritable and you won’t be able to modify ANY words in your dictionary! 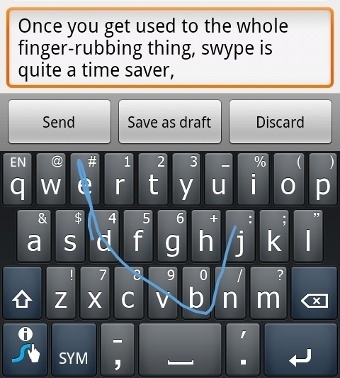 Now you need to get the latest version of Swype. Uninstall your current version of Swype however you prefer (via Settings -> Applications on your phone, or via ‘adb uninstall’ from a terminal), run SwypeInstaller and update when prompted (or get the latest installer directly from http://beta.swype.com/android/get), and complete the ENTIRE installation process. You’re not done until you press the “FINISH” button on the last page. Before continuing, you MUST load and use Swype to enter at least a couple of words. This is important, as it makes sure that all of Swype’s configuration files are generated properly before restoring your UDB backup. WRITE DOWN THE 5 DIGIT NUMBER FOR UID AND GID. In my case this is 10076 but yours may (and probably will be) different. Now we need to kill all running instances of Swype and SwypeInstaller. To do this, you need to deselect Swype as your active input method (long-press a text field, select Input Method, and choose anything other than Swype), and DISABLE Swype in Settings -> Language & Keyboard by unchecking the entry for Swype. PID’ to kill it. When you run ‘ps | grep swype’ you’ll want to look at the second column. That’s the PID. The last step is to restore file ownership. Remember that 5-digit UID/GID we copied down earlier? You’ll use the command ‘chown PID:GID FILENAME’ to change ownership of the file we just restored back to the Swype application. Here’s how the command looks using my UID/GID (10076). And remember you must use your own UID/GID that you copied down earlier! Don’t just copy/paste the command below! personal experience: to be sure, also add the following line. it solved the problems that came up on my phone. That’s it! You should now be able to re-enable Swype from Settings -> Language & Keyboard, re-select Swype as your default input method (via long-press of a text-field and selecting Input Method, then Swype) and start Swyping using your old UDB. Hope this helps some of you root users out there. Happy Swyping! nice, thanks! worked pretty good and since the swype OTA upgrade wasn’t working correctly and thus I was going this way :) Thanks a lot! I have used your described method few times without any issues. But recently, I have upgraded my galaxy s2 to the official JellyBeans ROM which comes with Nuance Swype 1.3.6 preinstalled which features the auto syncing of user dictionary. However, I want to add the words from the previous version of swype to Nuance’s Swype but I could locate the UDB folder or UserData.udb file in \data\data\com.nuance.swype.input or in \data\user\com.nuance.swype.input. Can you help me in updating the database in this new version from previous versions? unfortunately, support for this method (inside the beta programme) was stopped one or two versions back. not sure if it ever worked from beta to a preinstalled version, but i assume it stopped working when they also changed the beta dict storage.